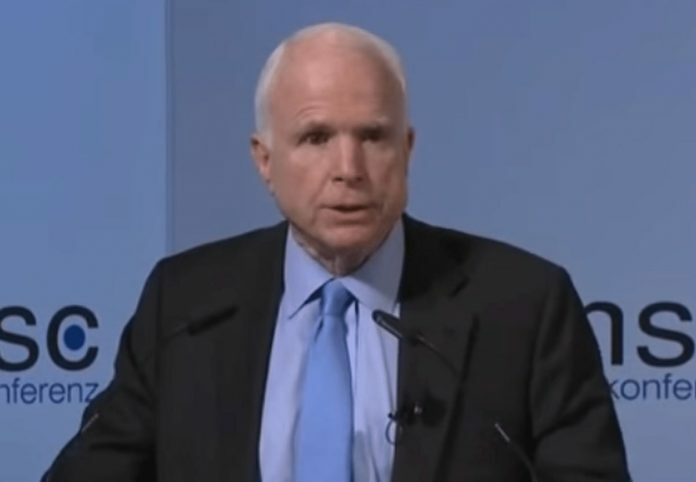 Republican Senator John McCain broke with the reassuring message that U.S. officials visiting Germany have sought to convey on their debut trip to Europe, saying on Friday that the administration of President Donald Trump was in “disarray”. McCain, a known Trump critic, told the Munich Security Conference that the resignation of the new president’s security adviser Michael Flynn over his contacts with Russia reflected deep problems in Washington. “I think that the Flynn issue obviously is something that shows that in many respects this administration is in disarray and they’ve got a lot of work to do,” said McCain. “The president, I think, makes statements (and) on other occasions contradicts himself. So we’ve learned to watch what the president does as opposed to what he says,” he said. The debut trip to Europe of Trump’s Defense Secretary Jim Mattis and Secretary of State Rex Tillerson, to a meeting of G20 counterparts in Bonn, went some way to assuaging concerns as they both took a more traditional U.S. position. But Trump is wrestling with a growing controversy at home about potential ties between his aides and Russia, which he dismissed on Thursday as a “ruse” and “scam” perpetrated by a hostile news media. Pence will say that Europe is an “indispensable partner” for the United States, a senior White House foreign policy adviser told reporters. “President Trump came into office and has thrown now his full support to NATO. He too espouses NATO’s need to adapt to today’s strategic situation for it to remain credible, capable, and relevant,” Mattis said. “We should be under no illusions about the step-change in Russian behavior over the last couple of years, even after Crimea,” British Defence Minister Michael Fallon said, referring to Moscow’s 2014 annexation of the Ukrainian peninsula. “We have different views,” Stoltenberg said of the crisis in Ukraine, where the West accuses the Kremlin of arming separatist rebels in a conflict that has killed 10,000 people since April 2014. Russia says the conflict is a civil war. Mattis, without explicitly citing the case, rallied to the defense of German forces as he spoke in the German city of Munich. “I have great respect for Germany’s leadership in Europe – and for the ethical performance of your troops on the battlefield,” he said. U.S. intelligence agencies concluded last year that Russia hacked and leaked Democratic emails during the election campaign as part of an effort to tilt the vote in Trump’s favor.